Why Do Dentists... Say Numbers? Have you ever wondered what your dentist means when they are examining your teeth and they start saying a string of numbers? After the checkup, your dentist will most likely explain what they’ve discovered, but you may still not be exactly certain what the string of numbers actually meant. In this series of articles we’ll explain some of the most common numbers that you might hear your dentist say. In Australia, dentists use a particular numbering system to identify the teeth that are present in the mouth. 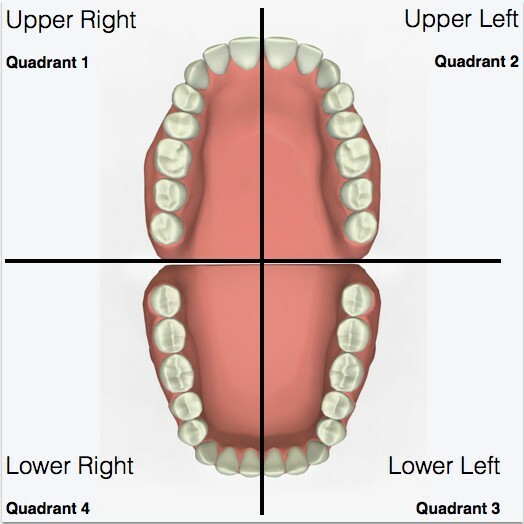 Each tooth is given a two digit number: the first one signifies which quadrant (corner) of the mouth the tooth is located in, and the second identifies the tooth type. Using these two sets of numbers, your dentist can identify each tooth in your mouth: so your upper right central incisor will be referred to as tooth 11 (and your dentist will say ‘one-one’, not ‘eleven’) and your lower left wisdom tooth is a 38 (‘three-eight’). Dentists at Corinna Dental take detailed records of every patient, and these tooth numbers are the shorthand way to record the presence or absence of particular teeth. Dentists will often start their examination of the teeth by taking a general look around the mouth and letting their assistant know which teeth are absent (and therefore which teeth to cross off the dental chart.) So they might say something like “One-eight, two-eight, three-eight and four-eight not present, possibly extracted, we’ll need to check that on the x-rays. Also missing is three-four.” What this means is that all of the wisdom teeth are missing, as well as the lower left first premolar. This tells the assistant that this patient has four fillings in the top right quadrant: a white (composite) filling on the chewing surface of the second molar, an amalgam filling covering two surfaces of the first molar and second premolar, and a white filling on the canine tooth. We’ll explain in another article what these letters mean. In this case, the dentist has noticed a shadow on one side of the upper right second premolar and will need an x-ray to confirm if this is decay. They’ve also noticed that there is a lot of wear on the chewing edges of the eight upper front teeth, which might be due to night-time clenching or grinding. The assistant will have a system of recording these findings, either by hand or using computer software. This generates a permanent record of the check up and forms the basis for treatment planning. 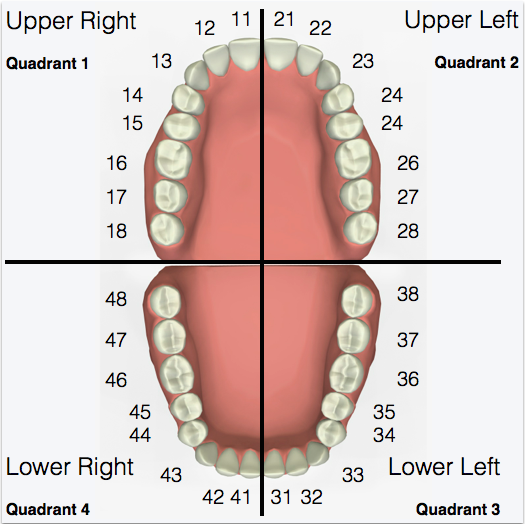 So the upper right first molar in a four year old child will be called a 55 (“five-five”), and the first tooth a baby gets (a front tooth at the bottom right or left) will either be the 71 “seven-one” or 81 “eight-one”. 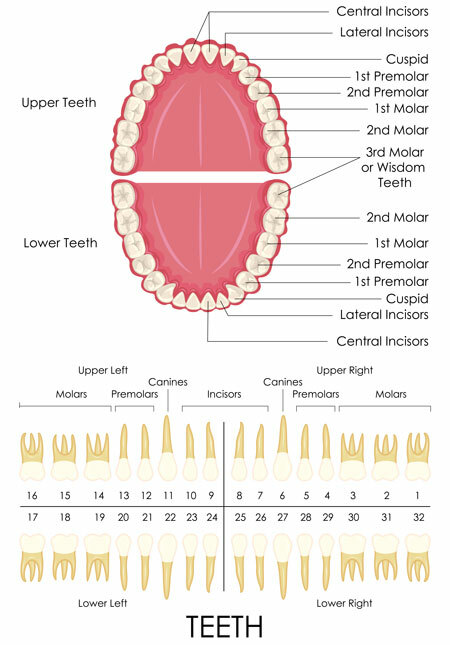 In the US a different tooth numbering system is used: each of the 32 teeth are given a number between 1 and 32. Once again, the numbering starts on the top right: however, the counting begins at the back of the mouth. So in the US, the upper right wisdom tooth (which in Australia is called the 18) is simply called tooth 1. The numeral 18 is used in the US to describe the lower left second molar. You can see how important it is to know which system is being used to describe the teeth!